Today, the house of Dimon (that is, JPMorgan Chase) released its first quarter earnings, revealing that first quarter 2011 profit rose by 67 percent versus the first quarter 2010. Also, the bank unveiled how much money it set aside for employee compensation for the quarter (a ton). And so if the bank can stay on track and enjoy three more fine quarters like the one it just had, its bankers, traders, and the rest of the JPMorgan lot stand to earn, on average, about 34 percent more this year versus last. Meanwhile, over at the house of Gorman (Morgan Stanley), things are not looking so hot. The firm is not expected to put up great numbers for the first quarter 2011 when it announces its earnings next week. And recently, many analysts on the Street have decreased their earnings estimates for the bank's first quarter. It seems Gorman and Co. are still struggling with costs associated with some very bad bets the bank made during the financial crisis (such as the joint venture with Mitsubishi UFJ Financial Group that has been a major money drain) as well as with how to fix its fixed income unit (among others). Which has me thinking about Vault's Banking Rankings. Last year, for the first time ever, J.P. Morgan ranked higher in prestige than its crosstown rival Morgan Stanley. J.P. Morgan came in third behind Goldman Sachs (the perennial No. 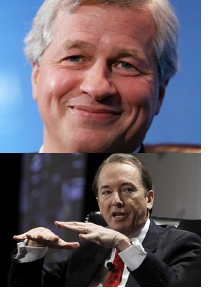 1) and Blackstone, respectively; Morgan Stanley placed fourth. This year, if the first quarter of the year is any indication (we've only just begun the annual survey process that will determine the rankings so we don't have any actual results yet) it's looking like J.P. Morgan might again have Morgan Stanley's number -- and perhaps, who knows, maybe Goldman's as well.